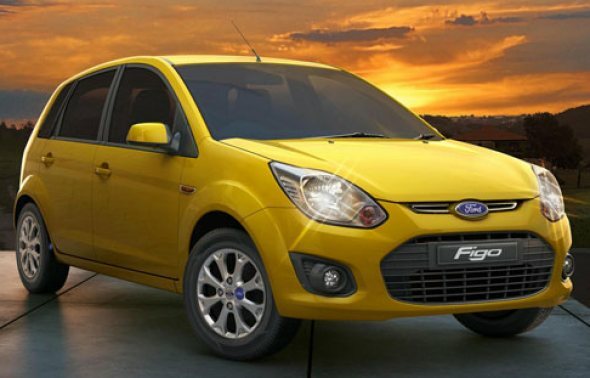 Is the new Ford Figo a serious challenger to the Maruti Swift? The new Ford Figo has been vastly improved by Ford – mainly in terms of looks, but there are some mechanical changes as well to the car. Is the new Figo better equipped to take on the Maruti Swift? The new Ford Figo has got refreshed looks that make it sportier and fresher. It has new headlamps, a hexagonal grille, new bumper, new tail-lamps and new alloys – which are some of the major external changes. Fit and finish is good. The Suzuki Swift continues to offer a sporty looking exterior, with a familiar design. Related: New Ford Figo launched! On the interiors, the Swift and Figo get predominantly grey coloring. However, the Figo has tried to spice up things a little with a blue-colored dash. The Figo offers slightly better interior space than the Swift in both seating space and luggage space. One sits lower in the Figo than in the Swift as well. In terms of looks – it’s a choice depending on what you prefer. But if space is a criteria, the Figo offers more. When you take the features on offer, the Figo has a distinct edge. For a much lower sticker price than the Swift ZDI, the top-end Figo Titanium diesel offers features such as electric mirrors, dual airbags, tilt steering, electric boot release, and integrated Bluetooth music system with phone connectivity and now also steering audio controls. Just these features can surely swing buyers in the direction of the Figo. However, the Figo does not offer rear power windows – something that not all buyers are comfortable with. The Swift ZDI has the essentials – electric power steering, mirrors and all 4 power windows. It has an integrated audio system with USB and Aux-in, but no Bluetooth. On features, if you are willing to overlook the lack of rear power-windows, the Figo offers more for a lower price. Among the petrol cars, Ford has improved the initial response of the petrol Figo quite a bit. However, it still is not a match for the excellent power delivery and acceleration in the Swift. In terms of driving feel, both cars feel great to drive in their own way. The Swift is sporty, faster and handles well, while the Figo too has a great driving position and feels nimble. Also read: New Ford Figo reviewed! Overall, in performance and handling, the Swift is a better car. Can the new Figo take the challenge to the Maruti Swift? No, it’s a better car, but it still has some drawbacks. One area where it can take on the Swift is in the pricing – the top-end Figo diesel is at Rs. 6 lakh, about Rs. 70,000 cheaper than the Maruti Swift, and this difference rises to over Rs. 1.2 lakh in the on-road pricing. For that kind of saving, it is worth considering.